Every Thursday in January and February (including TODAY), the Wenatchee River Institute is hosting free guided snowshoe strolls along the Riverfront Trail in Leavenworth. Saturday at 11 a.m., it’s Family Storytime at the Wenatchee Library. Local history comes alive at the Wenatchee Valley Museum & Cultural Center on Saturday and Sunday during the annual People of Our Past program. On Sunday, you can take a guided snowshoe hike at Lake Wenatchee State Park. Night skiing and live music at Mission Ridge on Saturday evening. Pybus Public Market’s annual Family Art Night happens on Tuesday. Next Friday is opening day at Rocky Reach Dam and Discovery Center. Next Saturday at Pybus Public Market, it’s Nick’s Bricks, a day of LEGO play, display, prizes, music and more. There will be a free art class for kids at the Wenatchee Valley Museum on March 2. On March 4, there will be a free class at the Wenatchee Library called “The Healing Power of Play.” From the event description: “When your child asks you to play, do you scramble to find reasons to say no? If you say yes, do you find yourself distracted, glancing at your phone or bored out of your mind? Why is playing with kids so hard to do? In this free class, learn some basics about child-led play. How to play with your children in ways that build trusting relationships and family connection. How often do you need to play with your kids? When is it important to let them play on their own? Learn from local parent coach and play advocate, Dylan Spradlin from Transforming Childhood and bring in some fun! On March 23, Sustainable Wenatchee is partnering with Joyful Scholars Montessori for their Joyful Tour of Sustainable Living. They’re offering classes on eco-parenting, cloth diapering, chicken keeping, biofeedback, fermentation and more. Take one class for $15, two for $30 or 3 classes for $35. All participants receive a reusable bag, sticker and all proceeds benefit Joyful Scholars Montessori. Afternoon vendors and a kids activity will be available. Registration is now open for the YMCA’s Lake Wenatchee Summer Camp, as well as winter swim lessons. The indoor playground at Pybus is open for the season. It’s a warm place full of toys for toddlers to play with during the cold months. With a few exceptions, the play area will be open Monday-Thursday from 9 a.m.-noon each week through March. Story times for children of all ages at the Wenatchee Public Library. 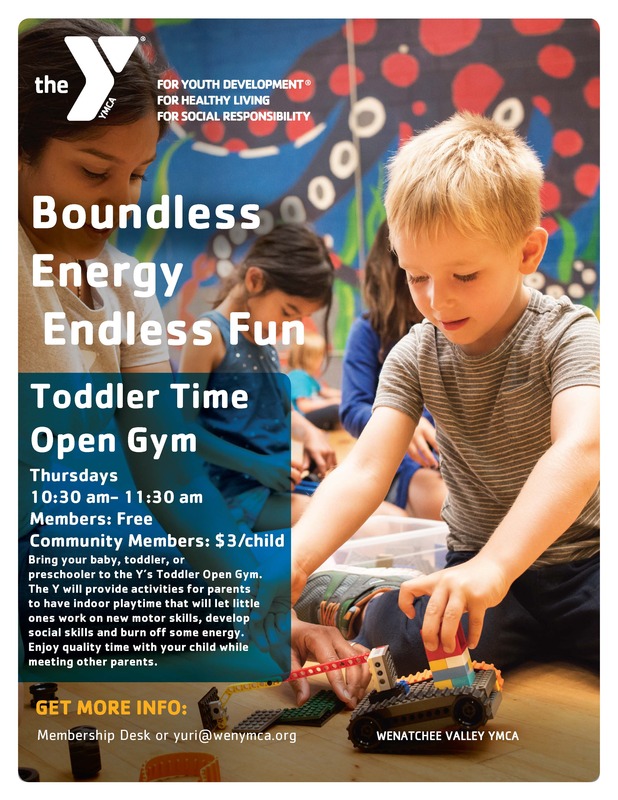 The Wenatchee YMCA offers Toddler Time Thursdays, open gym for little ones every Thursdays from 10:30-11:30 a.m.